How much do you think ocean freight cost account for in the shelf price of consumer goods? Though sea transport costs the least in comparison to other transport modes like rail, road, and air. But how low do you think it is? The International Chamber of Shipping has a table that illustrates the incredibly low cost of shipping America's favorite consumer goods across the ocean. Although the shipping industry has enjoyed record markets and freight rates in recent years, oceanborne transport costs for consumer goods have historically represented only a small fraction of the shelf price, and continuous improvements in technology and efficiency have helped ensure maritime transport costs remain very competitive. The transport cost element in the shelf price of goods varies from product to product, but is ultimately marginal. For example, transport costs account for only 2% of a television shelf price and only 1.2% of a kilo of coffee. As you see in the below picture, the typical cost to a consumer in the United States of transporting crude oil from the Middle East, in terms of the purchase price of gasoline at the pump, is about half a US per litre. The typical cost of transporting a tonne of iron ore from Australia to Europe by sea is about USD12. How’s about other transport means? Sea transport costs the least in comparison to other transport modes. We can see comparison of transport cost and transit time among those modes in another research by the Chamber of Commerce of the United States:Land Transport Options between Europe and Asia: Commercial Feasibility Study. 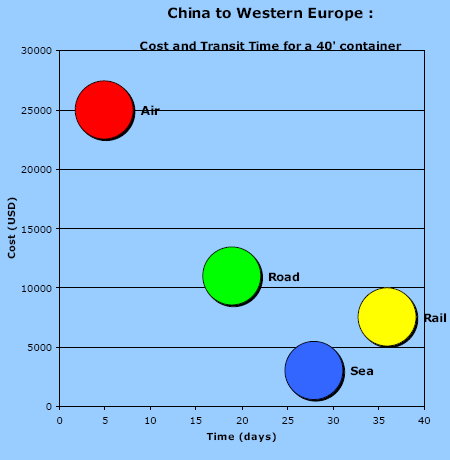 The study compares the costs of transporting a 40’ container between China (Shanghai) and Western Europe by different modes: sea, rail, road, and air. 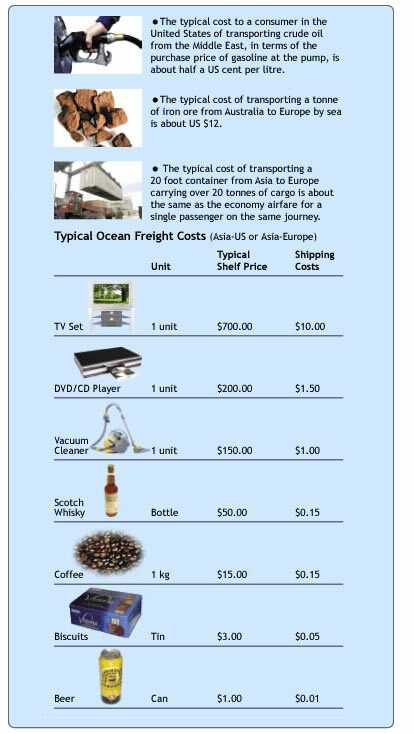 The diagram shows clearly that ocean transportation is cheap with lowest ocean freight cost of around USD3,000, but has long transit times. The other extreme is air transport, which is expensive but fast. For trucking, the costs are 3 to 4 times that of ocean transport and transit times are found to be roughly one week shorter. However, there seems to be huge potential for shortening transit times of trucking even further. For rail solutions, the transport costs are higher than for ocean transport and the transit times are found to be unpredictable.